Two ephemeral native wildflowers are thriving under the cherry trees near the McCallum Street entrance walk into the park. No one is sure where they came from, since they were not intentionally planted. We suspect they may have been dormant tag-alongs with other plants donated to the park. The upper photo shows a spreading patch of Dicentra canadensis. 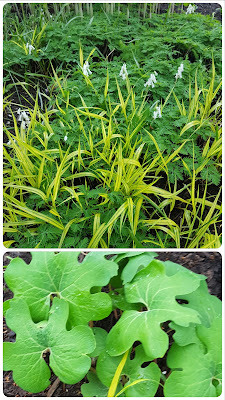 Its deep green, finely cut foliage, accented by clean white flowers, grows from yellow tubers that give it its quirky common name, Squirrel Corn. It is spreading more quickly each year into an area planted by chartreuse Japanese Forest Grass which will lengthen to fully conceal it as it goes dormant by summer. The lower photo shows the unusual leaves of Sanguineria canadensis, which has delicate white flowers that last only a few days in early April. Curiously, it too gets its common name, Bloodroot, from its underground structure, a rhizome that bleeds red (toxic) juice.